NK cells destroy microbe-infected cells while sparing healthy cells, and are controlled, in part, by inhibitory receptors specific for class I Ag-presenting molecules. CD1d1, a β2-microglobulin-associated class I-like molecule, binds glycolipids and stimulates NKT cells. We previously demonstrated that target cell lysis by IL-2-activated mouse NK cells is inhibited by target cell expression of CD1d1, suggesting that IL-2-activated NK cells may express a CD1d1-specific inhibitory receptor. We now report that a significant subset of mouse IL-2-activated NK cells specifically binds cell size beads displaying either naturally expressed or recombinant CD1d1. In contrast, although tetramers of soluble recombinant CD1d1 loaded with α-galactosylceramide identify NKT cells, binding of this reagent to resting or IL-2-activated NK cells was undetectable, even with activated NK cells sorted with CD1d1 beads. Cytotoxicity by the CD1d1 bead-separated NK subset was strongly inhibited by CD1d1, compared with the NK cell subset not bound to CD1d1 beads. An Ab that blocks NKT cell recognition of CD1d1 also reverses CD1d1 inhibition of NK lysis, suggesting that TCRs of NKT cells and NK inhibitory receptor(s) may interact with a similar site on CD1d1. These results provide direct evidence for a physical interaction of NK cells with CD1d1, mediated by a functional, CD1d1-specific low-affinity inhibitory NK receptor. Display of ligands on cell size beads to maximize multivalent interaction may offer an alternative approach to examine NK cell receptor-ligand interactions, particularly those of lower expression and/or lower affinity/avidity that may go undetected using tetrameric reagents. Natural killer cells can lyse microbe-infected cells and release IFN-γ while contributing to innate resistance (1). In addition, NK cells can recognize and destroy cancer cells (2). NK cells eliminate MHC class I-deficient cells while sparing cells expressing self-class I Ag-presenting molecules (3). Reduction of class I expression on target cells leads to a reduction of inhibitory signals transmitted through class I-specific inhibitory receptors expressed by NK cells, allowing NK cell-mediated target lysis to occur via partially defined activating receptors (4, 5, 6). The killer Ig-related (human) and lectin-like Ly-49 (mouse, rat) NK inhibitory receptor families contribute to this regulation and are allele-specific in their recognition of self-class I MHC molecules (7, 8). Regulation of NK cells is not limited to classical class I molecules. Mammals also express CD94/NKG2A, an inhibitory heterodimeric receptor that recognizes the nonclassical HLA-E (human)/Qa-1b (mouse) molecules bound with peptides derived from the leader sequences of classical class I MHC molecules (9, 10). Some non-MHC encoded, stress-induced MHC class I-related molecules activate NK cells through recognition by the lectin-like NKG2D activating receptor (11, 12, 13). Thus, NK cells express receptors that monitor the expression of classical class I molecules, MHC-encoded nonclassical class I closely related to their classical class I counterparts, and more distantly related MHC class I-like molecules, some of which are encoded outside of the MHC. CD1d genes are conserved between mouse and humans and encode nonpolymorphic MHC class I-like molecules not genetically linked to the MHC (14, 15). The mouse genome contains two highly homologous CD1D genes, CD1D1 and CD1D2. The CD1d α-chains exhibit ∼30% amino acid identity with classical class I molecules in the more conserved α3 domain and less elsewhere. The CD1d α-chain associates with β2-microglobulin, but unlike classical class I molecules, its cell surface expression is independent of the TAP (16, 17). CD1d1 is expressed on hemopoietically derived cells and hepatocytes (14), whereas a functional CD1d2 is not found in the B6 strain, and possibly other strains (18). CD1d1 binds glycolipids, including endogenous GPI, but this compound is not antigenic (19). Natural microbial ligands of human and mouse CD1d molecules remain largely undefined. CD1d1 is a ligand for NKT cells, a subset of T lymphocytes that expresses a semi-invariant TCR, as well as certain receptors normally expressed on NK cells, such as NKR-P1C (20). NKT cells rapidly produce copious amounts of cytokines, including IFN-γ and IL-4, upon stimulation (20) and perform immune regulatory functions (21, 22, 23). NKT cell responses to CD1d1 are substantially augmented when CD1d1 is bound with α-galactosylceramide (α-GalCer),3 a glycosphingolipid isolated from a marine sponge that may mimic an undefined natural glycolipid ligand of CD1d1 (24). CD1d1 may not be limited to serving as a stimulatory ligand for NKT cells. We have demonstrated that expression of mouse CD1d1 (mCD1d1) by target cells inhibits IL-2-activated NK cell-mediated cytotoxicity (25). This inhibition was partially disrupted by an Ab specific for CD1d1, suggesting that inhibition may be due to an NK cell-expressed inhibitory receptor that interacts with CD1d1 on the target cell (25). Since that report, Carbone et al. (26) have shown that expression of related human CD1a, CD1b, or CD1c molecules can also confer protection from human NK cell-mediated lysis. Furthermore, Abs to each of these CD1 molecules could disrupt the inhibition of target lysis by human NK cells, again suggesting that interactions of CD1 molecules at the cell surface with unidentified NK inhibitory receptor(s) may be responsible for the observed inhibition (26). These results are consistent with our previous observations, although it remains to be determined whether human CD1d also inhibits NK cell functions. However, taken together, these results suggested that inhibitory receptors may be expressed by NK cells that recognize CD1 molecules. To explore this possibility further, we examined interactions of NK cells with cell size beads bound with CD1d1 molecules isolated from mouse target cells made resistant to NK lysis by CD1d1 transfection, or recombinant CD1d1. In this report we show for the first time, that a specific physical interaction of IL-2-activated NK cells occurs with isolated CD1d1. Furthermore, sorting of CD1d1 bead-bound NK cells showed enrichment of NK cells that are inhibited by CD1d1. This NK cell interaction with CD1d1 was not identifiable using α-GalCer CD1d1 tetramers. Our results provide strong evidence for the existence of an NK receptor that recognizes CD1d1 and show that the physical form of CD1d1 presentation influences its recognition by NK cells. Female C57BL/6 and C57BL/6 × 129 recombination-activating gene (Rag)-1−/− mice at 6–8 wk of age were purchased from The Jackson Laboratory (Bar Harbor, ME). Experiments met the approval of the Animal Welfare and Policy Committee of the University of Alberta (Edmonton, Alberta, Canada). The anti-CD1d hybridoma, 1B1 (rat IgG2b), was previously described (27). The anti-CD1d hybridoma 15F7 (rat IgG2b) (18), monocyte/macrophage marker-specific hybridoma F4/80 (rat IgG2b) (28), and the mouse class II MHC-specific hybridoma M5/114.15.2 (rat IgG2b) (29) were obtained from the American Type Culture Collection (Manassas, VA). Ab-containing supernatants were generated from these hybridomas. Purified Abs were also prepared by ammonium sulfate precipitation of supernatants obtained from hybridomas grown in protein free culture medium. Purified 145-2C11 (hamster IgG), which recognizes the mouse CD3ε chain (30), was purchased from BD Biosciences (San Diego, CA). FITC-labeled goat anti-rat and rat anti-mouse secondary Abs were purchased from Jackson ImmunoResearch Laboratories (West Grove, PA). The TAP-2-deficient RMA-S T lymphoma and the RMA-S.CD1d1 transfectant were previously described (17). Both tumor cell lines were maintained in RPMI 1640, 10% heat-inactivated bovine calf serum (BCS), 24 mM NaHCO3, 500 μM l-glutamine, 50 U/ml penicillin, and 50 μg/ml streptomycin. In the case of RMA-S.CD1d1, 100 μg/ml G418 was included in cultures and removed 48–72 h before assays. Single cell suspensions of C57BL/6 × 129 F1 Rag-1−/− spleens were prepared in RPMI 1640 supplemented with 3% BCS, using a tissue grinder. Cells were plated at 1 to 2 × 105 cells/ml in RPMI 1640 supplemented with 10% FCS, 24 mM NaHCO3, 500 μM l-glutamine, 50 U/ml penicillin, 50 μg/ml streptomycin, 1 mM sodium pyruvate, 0.1 mM nonessential amino acids, 5 × 10−5 M 2-ME, and 1000 U/ml human rIL-2 (NK medium) and incubated at 37°C for 3 days. On day 3, day 6, and day 9, nonadherent cells were removed then fresh complete NK medium was added to the adherent cells. Where cultures significantly exceeded 2 × 105 cells/ml, between days 5 and 7, adherent cells were lifted and replated at a concentration of 1–2 × 105 cells/ml in fresh NK medium. Day 13 adherent IL-2-activated NK cells were harvested for bead selection. IHLs from normal B6 mice were prepared by methods similar to those described (31). The pellet resulting from the 10 min, 4°C 300 × g centrifugation, as outlined (31), was resuspended in 40% Percoll and underlaid with 60% Percoll. Following a 20 min centrifugation at 1500 × g, the harvested buffy coat was removed and washed with 10 volumes of cold serum-free RPMI 1640 before use. CD1d1 was purified by immunoaffinity chromatography from RMA-S.CD1d1 transfectants, using a 1B1 immunoaffinity column, as previously described for isolation of mouse MHC classical class I molecules (32, 33). Solid-phase ELISA with the 1B1 Ab, and protein quantitation determined by Micro BCA assay (Pierce, Rockford, IL), was performed as described (32), on eluted immunoaffinity column fractions. Fractions showing strong ELISA reactivity were pooled for CD1d1 bead preparation. Insect cell-derived CD1d1 monomers were prepared as previously described (31). Insect cell expressed CD1d1 (iCD1d1) was biotinylated and pulsed with either “vehicle” (0.5% polysorbate-20 and 0.9% NaCl) or a 3-fold molar excess of α-GalCer in the vehicle solution, for 12–18 h at room temperature. α-GalCer was obtained from the Pharmaceutical Research Laboratory at Kirin Brewery (Gunma, Japan). The α-GalCer-loaded or vehicle iCD1d1 monomers were neither tetramerized nor fluorescent when bound to cell size beads. Fluorescent PE-labeled or Nile red-labeled cell-sized (4.0 μm) beads were purchased from Interfacial Dynamics (Portland, OR). For preparation of CD1d1 beads, typically, 1.2–1.5 μg of mouse or iCD1d1 was mixed with 1 × 107 beads and PBS in a total volume of 1 ml. A similar amount of BSA was added to 1 × 107 beads separately. Bead-protein mixtures were rotated overnight at 4°C. Unbound sites on the beads were blocked with 2% BCS in PBS (blocking solution) by rotation for 30 min at room temperature. After three washes with blocking solution, the beads were counted and resuspended in NK medium at 4.0 × 107 beads/ml. Protein-bearing beads were then sterilized by gamma irradiation. PE- and Nile red-labeled beads behaved identically and were used interchangeably, depending on availability from the manufacturer. Following Versene treatment to detach IL-2-activated NK cells from flasks, and thorough washing with PBS, NK cells were resuspended in NK medium. The NK cells were then labeled with FITC as previously described (34). Briefly, NK cells and filter-sterilized FITC were incubated together for 30 min in PBS in the dark at 2.0 × 106 cells/ml and 2.5 μg/ml, respectively. For NK cell/protein-coated bead interactions, FITC-labeled NK cells and BSA or CD1d1 beads were mixed together in a 1:1 cell to bead ratio at concentrations of 2.0 × 106 cells and 2.0 × 106 beads/ml, respectively. Resulting mixtures were slowly rotated for 1 h at 37°C. Percentages of binding and nonbinding NK cells were based on sorter events that were positive for both FITC (labeled NK cell) and PE (bead). Only NK cell/CD1d1 bead mixtures were sorted, with bead-binding and nonbinding NK cells collected as separate fractions. Bead-binding and nonbinding NK cells were plated separately at 1–2 × 105 cells/ml in NK medium overnight for use in 51Cr release assays the following day. In some experiments, IL-2-activated NK cells that did not bind beads bearing mCD1d1 in a first incubation (nonbinders) were then incubated with beads bearing BSA, iCD1d1, or iCD1d1 pulsed with α-GalCer, before enumeration of bead-cell conjugates. For Ab blocking of bead binding, CD1d1 or BSA bearing beads were incubated with no Ab, 15F7 (anti-CD1d), or F4/80 (isotype control) for 30 min at room temperature, before incubation with IL-2-activated NK cells. Protein-coated beads were incubated with 1B1, or 15F7 Ab-containing hybridoma supernatants, or isotype controls, for 45 min on ice. Following three PBS washes, the beads were incubated with goat anti-rat IgG FITC-coupled secondary Ab at a concentration of 14 μg/ml for another 45 min on ice. Beads were then washed three times and analyzed immediately by flow cytometry. Staining of spleen cells or IHLs for CD3 expression was as described, using FITC-labeled 145-2C11 Ab (30). Staining by PE-labeled α-GalCer-loaded CD1d1 tetramer was performed as previously described (31). Briefly, PE-α-GalCer-loaded CD1d1 tetramers (31) were incubated at a ratio of 50 μg of tetramer per 1.0 × 106 cells in a total volume of 100 μl, for 2 h on ice at 4°C, followed by extensive washing and flow cytometric analysis. Each flow cytometric analysis was conducted multiple times with similar results. Target cells were labeled with 100 μCi of Na51CrO4 for 1 h at 37°C. After extensive washing, 1 × 104 51Cr-labeled target cells were incubated with C57BL/6 × 129 Rag-1−/− IL-2-activated NK cells for 4 h at 37°C in a V-bottom microtiter plate, in triplicate. Percentage of lysis was determined as [(experimental release − spontaneous release)/(maximal release − spontaneous release)] × 100. For Ab inhibition experiments, Abs were preincubated with a mixture of protein A and protein G (4 μg/10 μg of mAb), obtained from ICN Pharmaceuticals (Costa Mesa, CA), for 30 min before addition to target cells. This was done to block the Fc portion of Abs from interaction with NK cell Fc receptors in the assay, as previously described (35). Target cells were then preincubated with the mAb (20 μg/ml) and protein A/protein G for 20 min before addition of effector cells. The final concentration of Abs in the cytotoxic assays was 10 μg/ml. The mAbs and protein A/protein G were present throughout the assays. Each cytotoxicity assay was performed multiple times with similar results. Significant differences between two groups were determined by two-tailed Student’s t test. A value of p < 0.05 was considered to be significant. We have shown previously that CD1d1 expression protects tumor target cells from NK lysis (25). These results suggested that NK cells may express an inhibitory receptor specific for CD1d1. To probe NK cell interactions with CD1d1 molecules, we prepared cell size latex beads bearing isolated CD1d1 prepared from transfected mouse cells. The CD1d1 was purified from CD1d1-transfected RMA-S tumor cells by standard procedures that isolate mouse MHC class I molecules (32, 33), and incorporated onto beads by detergent dilution methods (36). 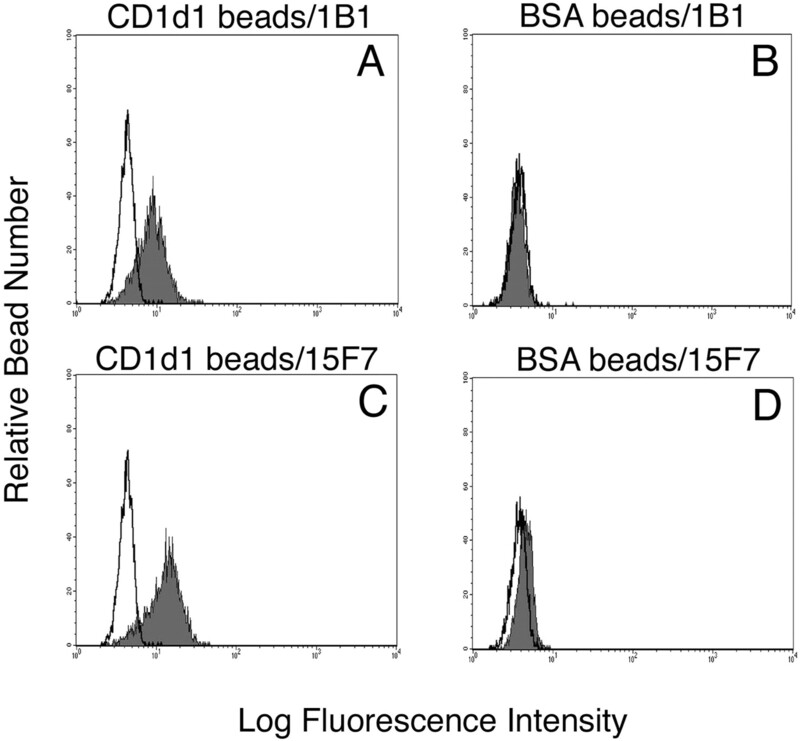 The CD1d1 displayed on the beads was readily detected by FACS analysis using CD1d1-specific Abs, such as 1B1 and 15F7 (Fig. 1⇓, A and C), respectively, whereas little or no 1B1 or 15F7 staining was detected with BSA bound beads (Fig. 1⇓, B and D). CD1d1 immobilized on the beads is stable at 4°C for several months (data not shown). Thus, CD1d1-bound cell size beads offer a platform for display of isolated CD1d1 molecules. Isolated CD1d1 binds to latex beads. Immunoaffinity purified CD1d1 isolated from CD1d1-transfected RMA-S cells, or BSA, was diluted in PBS to >1.2 μg/ml and incubated with 1 × 107 cell size (4.0 μm) PE-labeled latex beads overnight at 4°C. Unbound sites on the beads were blocked with 2% BCS in PBS for 30 min. CD1d1 or BSA beads were analyzed by flow cytometry following incubation with 1B1 or 15F7 (anti-CD1d mAbs), or M5/114.15.2 (isotype control) and FITC-labeled goat anti-rat IgG secondary Ab. Staining of CD1d1 beads (A and C) or BSA beads (B and D) are indicated. Isotype control staining profiles are unfilled, whereas 1B1 (upper) and 15F7 (lower) profiles are shaded. Preparation and staining of CD1d1 and BSA beads was repeated three times with similar results. Freshly isolated spleen cells and day 13 IL-2-activated adherent NK cells from B6 × 129 Rag-1−/− mice were examined for interaction with cell size beads bearing isolated CD1d1, or with BSA control beads. Cells from the B6 × 129 Rag-1−/− mice were used in this study because they do not develop B cells or T cells (37), but they do develop NK cells. Hence, use of cells from Rag-1-deficient animals allowed analysis of NK cell interactions with CD1d1, in the absence of CD1d1-reactive NKT cells. Typically, 75–80% of fresh and 95% of IL-2-activated B6 × 129 Rag-1−/− spleen cells, respectively, are phenotypically NK cells as indicated by PK136 mAb (anti-NK1.1) staining (data not shown). FITC-labeled cells were incubated with PE-labeled CD1d1 or BSA beads, after which bead conjugates were enumerated as dual color events by flow cytometry. We routinely observed that ∼8–9% of fresh spleen cells from the Rag-1−/− mice bind to both CD1d1 and BSA bearing beads (Fig. 2⇓A, top panels). Thus, no specific interaction with CD1d1 is indicated in this conjugate assay with fresh spleen cells. This is consistent with little to no inhibition of cytolysis by target cell expression of CD1d1, using fresh spleen effector cells that include unstimulated NK cells (data not shown). By contrast, we consistently observed that a significant portion, (13–18%), of IL-2-activated adherent NK cells conjugate with CD1d1 bearing beads, whereas binding to BSA beads is <5% as shown in Fig. 2⇓A, bottom panels. Results of three independent experiments are indicated in Fig. 2⇓B. The vast majority of cells from the IL-2-activated cultures that bound the CD1d1 beads were NK cells because >92% of them were NK1.1+ (data not shown). 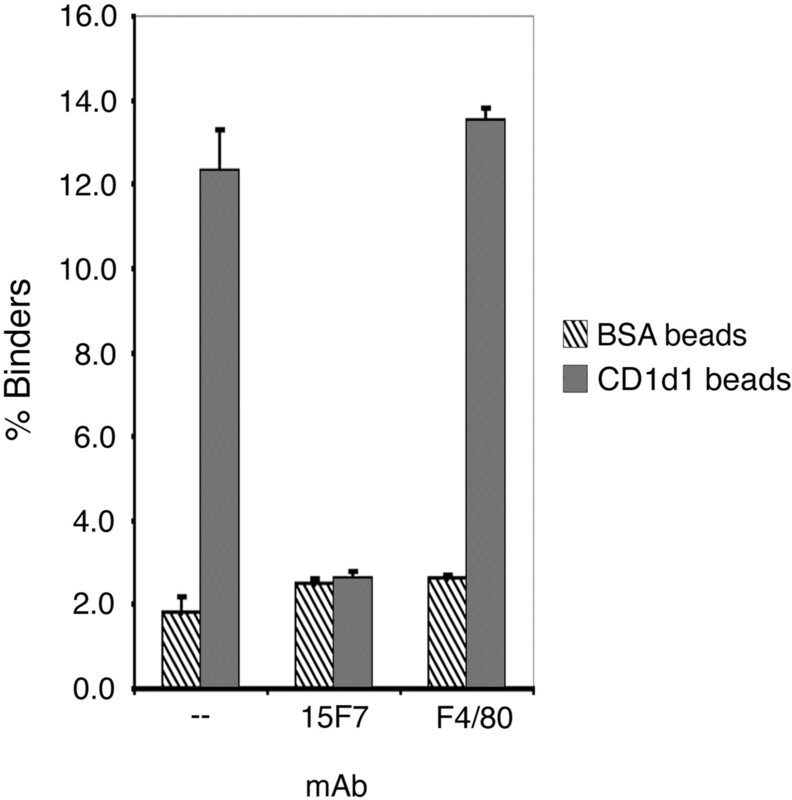 Binding of IL-2-activated NK cells to CD1d1 bearing beads was reduced to background binding of BSA beads by the 15F7 Ab, which recognizes CD1d1, but not by an isotype control (Fig. 3⇓). These results confirm that it is CD1d1 that is mediating the interaction of the activated NK cells with the beads. Taken together, these data suggest that culture in the presence of IL-2 induces an ability to specifically interact with CD1d1 by a subset of NK cells, or possibly leads to expansion of a very small CD1d1 reactive NK subset that is not readily detectable with fresh spleen cells. A subset of IL-2-activated NK cells specifically binds CD1d1 beads in conjugate assays. A, FITC-labeled fresh spleen cells or day 13 IL-2-activated NK cells from B6 × 129 Rag-1−/− mice were incubated with PE-labeled beads bearing CD1d1 or BSA at a 1:1 ratio (2.0 × 106 cells/ml and 2.0 × 106 beads/ml) for 1 h at 37°C, under slow rotation. Results with fresh spleen cells (upper) and those with IL-2-activated NK cells (lower) are shown. Cell-bead conjugates are dual color events in the upper right quadrants. The percentage of fresh spleen cells or IL-2-activated NK cells in each quadrant is indicated. B, Percentages of cell-bead conjugates enumerated and combined from three separate experiments using IL-2-activated Rag-1−/− NK cells. Data are expressed as mean percentages of cell binding ± SD. The mAb 15F7 blocks interaction between CD1d1 beads and IL-2-activated NK cells. Nile red fluorescent beads bearing BSA or CD1d1 were prepared as described for PE beads in Fig. 1⇑. Beads bearing BSA or CD1d1 were incubated with 1.5 μg/ml 15F7 (anti-CD1d1) or F4/80 (isotype control) for 30 min at room temperature. Subsequent incubation with FITC-labeled day 13 IL-2-activated NK cells from B6 × 129 Rag-1−/− mice occurred at a 1:1 ratio (2.0–4.0 × 106 cells/ml and 2.0–4.0 × 106 beads/ml) for 1 h at 37°C, under slow rotation. Data are the percentage of IL-2-activated NK cells in cell-bead conjugates. The mAb used, or lack thereof (dash), is indicated on the horizontal axis. The data are in duplicate and are presented as mean percentages of cell binding ± variance. Similar results were obtained in three experiments. NKT cells constitute a small subset of T cells that express NK cell receptors and rapidly secrete large quantities of cytokines in response to CD1d1, particularly CD1d1 bound with the glycolipid α-GalCer (24, 38). This response is mediated by semi-invariant TCRs expressed by NKT cells (14). NKT cells can be identified by flow cytometry through specific binding of fluorescent α-GalCer-loaded CD1d1 tetramers and simultaneous binding of TCR complex-specific Abs (31, 39). Soluble CD1d1 used for preparation of tetramers has been obtained from insect cell expression systems (31, 39). We attempted to identify an IL-2-activated NK cell subset with tetramers composed of soluble CD1d1 expressed in an insect cell expression system loaded with or without α-GalCer. First, we confirmed that α-GalCer loaded CD1d1 tetramers bind CD3+ NKT cells. It has been shown previously that a significant subset of IHLs are CD3+ NKT cells and stain with α-GalCer CD1d1 tetramers (31), as we also observe (Fig. 4⇓A). Unlike IHLs, however, essentially none (<0.5%) of the fresh spleen cells or unfractionated adherent IL-2-activated NK cells from the Rag-1−/− mice, respectively, bound CD1d1 tetramers (Fig. 4⇓, B and C). The lack of CD1d1 tetramer interaction with IL-2-activated NK cells contrasts substantially with CD1d1 bead interactions of IL-2-activated NK cells we observed in Fig. 2⇑. To more directly address this issue, we sorted IL-2-activated NK cells into two groups, those that bound CD1d1 beads and those that did not, for subsequent CD1d1 tetramer staining. This approach, in the case of CD1d1 bead-sorted NK cells, offers a potential enrichment of NK cells that might interact with CD1d1 tetramers. After sorting, and overnight culture to allow release of NK cells from any bound beads, neither the CD1d1 bead-bound and sorted NK cells (Fig. 4⇓D), nor the unbound NK cells (Fig. 4⇓E), stained with CD1d1 tetramers to any appreciable degree. These results indicate that although beads bearing CD1d1 bind and can select an IL-2-activated NK cell subpopulation, recombinant soluble CD1d1 tetramers do not bind these or any other IL-2-activated NK populations. These differences suggest that the physical form or characteristics of CD1d1 matter significantly for the NK cell interaction. α-GalCer CD1d1 tetramers bind NKT cells, but not unfractionated IL-2-activated NK cells or activated NK cells selected by CD1d1 beads. Gated populations are plotted as FITC-labeled anti-CD3 (horizontal axis) vs PE-labeled empty (left column) or α-GalCer-loaded (right column) CD1d1 tetramer staining (vertical axis): B6 IHLs (A); fresh B6 × 129 Rag-1−/− spleen cells (B); unfractionated IL-2-activated B6 × 129 Rag-1−/− NK cells (C); CD1d1 bead selected B6 × 129 Rag-1−/− IL-2-activated NK cells (D); CD1d1 bead nonbinding B6 × 129 Rag-1−/− IL-2-activated NK cells (E). Similar results were obtained in three independent experiments. To assess the functional significance of CD1d1 binding by an IL-2-activated NK cell subset, we compared cytotoxicity against RMA-S and a RMA-S.CD1d1 transfectant, by sorted CD1d1 bead-bound NK cells (binders) with NK cells that did not bind CD1d1 beads (nonbinders). Overnight culture following the bead sorting was done before the cytotoxicity assays to allow bead-adherent NK cells to become detached from the beads. The percentages of binders and nonbinders obtained, respectively, were as shown in Fig. 2⇑ (data not shown). Binders demonstrated substantial lytic activity against RMA-S, a class I MHC deficient cell line, but RMA-S cells transfected with CD1d1 were highly resistant to lysis by these cells, p < 0.001 (Fig. 5⇓A). 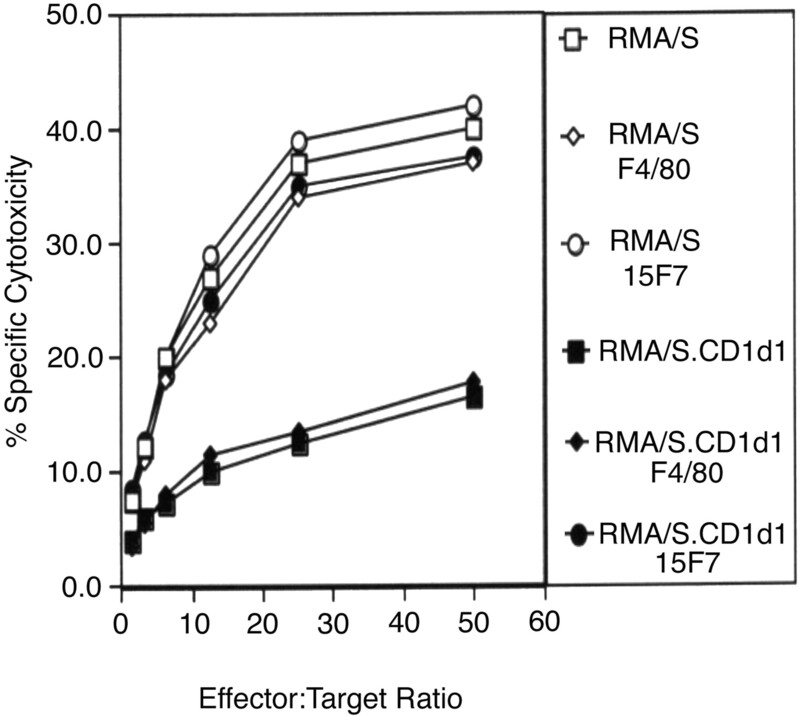 By contrast, lysis of CD1d1-transfected RMA-S cells was only modestly reduced compared with RMA-S by the nonbinders (Fig. 5⇓B). From these results, we conclude that CD1d1 isolated from RMA-S.CD1d1 cells can enrich or select an NK cell subset that is strongly inhibited by CD1d1. The residual inhibition of nonbinders by target CD1d1 expression is statistically significant (p < 0.05), and amounts to a reduction of ∼15% of unbound IL-2-activated NK cell cytotoxicity (Fig. 5⇓B). This suggests that a small portion of CD1d1-inhibited NK cells may remain after CD1d1 bead sorting. We have attempted to isolate residual CD1d1-regulated cells by multiple rounds of CD1d1 bead selection, without success. We have also isolated natural CD1d1 in more concentrated form resulting in immobilization of CD1d1 at higher densities on beads, however these beads still do not increase the percentage of bound NK cells nor diminish the modest residual CD1d1 regulation of residual NK cells. It is conceivable that such NK cells may express a putative CD1d1-specific inhibitory receptor at a low yet still functional density, but the maximal CD1d1 density that we can immobilize on the beads may be insufficient to also select these NK cells. CD1d1 bead-sorted, IL-2-activated NK cells are strongly inhibited by target cell CD1d1 expression. FITC-labeled day 13 IL-2-activated B6 × 129 Rag-1−/− NK cells were incubated with PE-labeled CD1d1 bearing beads for 1 h at 37°C under rotation, then sorted by flow cytometry into CD1d1 bead binders and nonbinders. The resulting two NK cell populations were separately incubated with 51Cr-labeled RMA-S or RMA-S.CD1d1 targets at an E:T ratio of 14:1. Cytotoxicity of CD1d1 bead binders (A) and nonbinders (B) was determined after 4 h. Results are expressed as the mean ± SE of five independent experiments. The ability of naturally expressed mCD1d1 presented on cell size beads, but not tetramers of recombinant iCD1d1, to identify and select an IL-2-activated NK cell subset could be due to differences in posttranslational modification or in the bound ligands between CD1d1 expressed in mouse and insect cells. Alternatively, the bead could offer an opportunity for extensive multivalent receptor interactions with CD1d1 on its surface, unlike CD1d1 tetramers that can engage at most three or possibly four CD1d1 molecules simultaneously. To directly examine these issues, recombinant insect cell expressed monomeric CD1d1 molecules, typically used to prepare CD1d1 tetramers, were immobilized on cell size beads at densities comparable to that of mCD1d1 (data not shown), and compared with beads bearing the naturally expressed mCD1d1 for IL-2-activated NK cell interaction. Furthermore, we used an experimental scheme that included mCD1d1 bearing bead preincubation with IL-2-activated NK cells, followed by incubation with beads bearing iCD1d1, to determine whether the same or distinct subsets of activated NK cells could be distinguished by the two sources of CD1d1 (Fig. 6⇓A). We found that the iCD1d1 beads formed conjugates with IL-2-activated NK cells and to an extent that is similar to that normally obtained with mCD1d1 beads (Fig. 6⇓B). This iCD1d1 bead binding contrasts with the lack of CD1d1 tetramer interaction with IL-2-activated NK cells shown in Fig. 4⇑, despite the same source of CD1d1. Binding of iCD1d1 beads occurred whether the iCD1d1 was bound with α-GalCer or not, indicating that this glycolipid ligand is not critical for activated NK cell binding by iCD1d1 (Fig. 6⇓B). The percentage of NK cells bound by the mCD1d1 beads, or iCD1d1 beads bound with or without α-GalCer, were comparable in multiple determinations with no consistent differences between these different forms of CD1d1 (data not shown). Because the mCD1d1 and iCD1d1 displayed on the beads identified a similar percentage of NK cells, it was not clear whether it is the same or a different subset of NK cells recognized by these two forms of CD1d1. 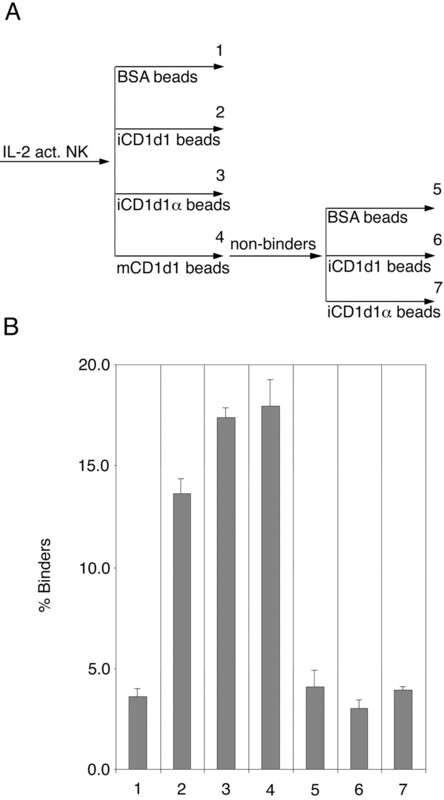 Prior removal of conjugates between IL-2-activated NK cells and mCD1d1 beads resulted in no binding of residual activated NK cells to iCD1d1 beads above the BSA bead background, whether bound with α-GalCer or not (Fig. 6⇓B). From these results, we conclude that native mCD1d1 and iCD1d1 share structural determinants for activated NK cell interaction and the form of presentation of the CD1d1, specifically on a large surface such as a cell or cell size bead, is critical to detect this interaction. Furthermore, the same activated NK cell subset is identified by mCD1d1 and iCD1d1 because the entire iCD1d1 bound subset was removed by prior activated NK cell interaction with mCD1d1 beads. Recombinant mouse CD1d1 expressed by insect cells binds an IL-2-activated NK subset when displayed on cell size beads, and it is the same subset that beads bearing CD1d1 expressed by mouse cells identify. iCD1d1, iCD1d1 bound with α-GalCer (iCD1d1α), and mCD1d1 (1.25 μg of each) were separately immobilized on 1 × 107 Nile red beads in 1 ml of PBS as described in Materials and Methods. BSA control, iCD1d1, iCD1d1 bound with α-GalCer, and mCD1d1 beads were each incubated with FITC-labeled day 13 IL-2-activated NK cells from B6 × 129 Rag-1−/− mice at a 1:1 ratio (2.0–4.0 × 106 cells/ml and 2.0–4.0 × 106 beads/ml) for 1 h at 37°C, under slow rotation. Flow cytometric sorting was performed after incubation to determine the relative number of bead-cell conjugates. Nonbinder NK cells from the mCD1d1/NK cell sort were collected and reincubated, with BSA, iCD1d1, and iCD1d1 bound with α-GalCer beads and bead-cell conjugates were enumerated. Incubations (A) and the results of conjugate assays (B) are presented. The data represent three separate determinations and are illustrated as mean percentages ± SD of cell binding. Our previous report indicated that a portion of IL-2-activated NK cells can be negatively regulated by CD1d1 (25). The preceding experiments in this study demonstrate that a subset of IL-2-activated NK cells exist that is selectable with isolated CD1d1 on beads, and is negatively regulated by CD1d1 expression on target cells. In our previous study, we attempted to block the protection from IL-2-activated NK/lymphokine-activated killer lysis mediated by CD1d1 by including the 1B1 CD1d1-specific Ab in the cytotoxic assays. In all such experiments, we were able to obtain only partial restoration of lysis with the 1B1 Ab (25). Additional Abs directed against CD1d1 have been generated, and clusters of Ab epitopes on CD1d1 have been defined (18). We tested whether inhibition of RMA-S.CD1d1 target cell lysis by IL-2-activated NK cells could be reversed by one of these additional CD1d-specific Abs, 15F7. Inclusion of this Ab in the cytotoxic assay completely restored lysis of RMA-S.CD1d1 to a level comparable to RMA-S (Fig. 7⇓). These results suggest that the 15F7 Ab may bind CD1d1 at a site that is particularly important for CD1d1 interactions with putative inhibitory NK cell receptor(s). The CD1d-specific Ab 15F7 fully restores IL-2-activated NK-mediated lysis of CD1d1 protected target cells. 51Cr-labeled RMA-S or RMA-S.CD1d1 target cells were incubated at various E:T ratios with day 13 IL-2-activated B6 × 129 Rag-1−/− spleen cells alone, or in the presence of 15F7 (anti-CD1d) or F4/80 (isotype control) Abs at a final concentration of 10 μg/ml. The mAbs were preincubated with a mixture of protein A (PA) and protein G (PG) (4 μg/10 μg of mAb) for 30 min before addition to target cells, to block the Fc portion of the Abs, thereby preventing Ab-dependent cellular cytotoxicity. Target cells were preincubated with the mAb and the protein A/protein G mixture for 20 min before addition of effector cells for the cytotoxicity assay. The mAbs and protein A/protein G were present throughout the assays. Cytotoxicity was measured after 4 h. The data represent the mean of triplicate wells. The experiment was performed three times with similar results. We have previously shown that Ag-specific cytotoxic T cell clones physically interact with cell size beads bearing isolated class I MHC alloantigens, forming Ag-specific CTL-bead conjugates that can stimulate T cell activation (40). In this study we have extended this approach to examine NK cell interactions with isolated CD1d1. In the present study we found that cell size beads bearing naturally expressed CD1d1 from mouse cells were able to physically interact with and select a subset of IL-2-activated NK cells that was negatively regulated by CD1d1. Similar results were obtained with multiple independent CD1d1 preparations (data not shown). Tetrameric forms of classical and nonclassical MHC class I, or class I-like molecules such as CD1d1, have been very useful in identifying Ag-specific T cell subsets or NK cell populations expressing certain class I-specific receptors (41, 42, 43, 44). However, we and others have not detected a significant level of interaction of α-GalCer CD1d1 tetramers with NK cells (Fig. 4⇑), (31, 39). Our observation that naturally expressed CD1d1, but not tetramers composed of insect cell expressed CD1d1 bound with α-GalCer CD1d1, interact with NK cells, suggests that the physical characteristics or form of CD1d1 may matter significantly in CD1d1 recognition by its putative NK receptor. It is conceivable that the naturally expressed CD1d1 is uniquely capable of interacting with NK receptor(s), possibly due to a requirement for posttranslational modifications of CD1d1 that are not conducted in insect cells. Alternatively, the interaction with a putative NK receptor may require a CD1d1-bound ligand that is not present in insect cells. An additional possibility is that the affinity of the putative NK receptor for CD1d1 is relatively low and is only detectable when CD1d1 is at a minimum density (40), enhancing the avidity of interaction over that obtainable with a tetramer. Our finding that immobilization of iCD1d1 on cell size beads results in conjugate formation with the same subset of IL-2-activated NK cells as beads bearing naturally expressed CD1d1, argues that the form of CD1d1 presentation, not a unique bound ligand or specific posttranslational modification of CD1d1, is the critical determinant in CD1d1 interaction with NK cells. CD1d1 interaction with NK cells required CD1d1 to be displayed on a large surface that approximates a cell, which promotes multivalent interaction. This suggests that the putative CD1d1-specific NK receptor is of lower affinity than other mouse NK receptors known to interact with MHC molecules, which can be detected with MHC tetramers (9, 44). Additional functional NK receptors that have low affinity for MHC or MHC-like molecules may exist that are undetectable by tetramer technology. Cell size beads containing MHC class I or class I-like molecules may offer an alternative to study NK receptor interactions with their natural ligands, with particular utility in detecting and studying lower affinity receptor-ligand interactions. There is an apparent paradox in our findings that a minor population of the activated NK cells binds CD1d1 beads, yet the unfractionated activated NK cell population is substantially inhibited by CD1d1 expression by target cells. This may be because the CD1d1 bound NK subset contributes a greater proportion of the RMA-S lysis than other NK cells. At similar E:T ratios, e.g., 12.5 to 14:1, typically the CD1d1 bound subset lyses RMA-S at a much higher level compared with the unfractionated population (Figs. 5⇑ and 7⇑). Consistent with this, the CD1d1 bead bound subset lyses RMA-S more efficiently than the unbound subset. Given this relationship, lysis by the unfractionated population would be impacted more by CD1d1 expression on targets than whether all NK cells lyse RMA-S cells equally effectively. In addition, we were not able to entirely separate CD1d1-regulated NK cells from the overall IL-2-activated NK cell population using CD1d1 bearing beads. A relatively small but consistent residual inhibition of cytotoxicity by target cell CD1d1 expression was observed with NK cells that did not bind CD1d1 beads. This could result from such NK cells expressing a lower density of a putative CD1d1 specific inhibitory receptor leading to partial inhibition of cytotoxicity, possibly through a reduction of productive target cell encounters, or more complete inhibition of only a small subset of the unbound NK cells. Our finding that CD1d1 expressed by mouse or insect cells binds NK cells suggests that the peptide backbone of CD1d1 contains the determinant(s) relevant to receptor interaction. This does not eliminate the possibility that an undefined endogenous glycolipid or other ligand from mouse and insect cells bound in CD1d1 participates in NK receptor binding. Nor does it exclude the possibility that pathogen-derived CD1d1 glycolipid ligands could influence receptor interaction in the context of an infection by a pathogen. From our studies, however, it is clear that α-GalCer, a glycolipid recognized by NKT cells when bound by CD1d1, is not required for NK cell interaction with CD1d1, nor does incubation of CD1d1 with α-GalCer interfere with NK cell recognition of CD1d1. Because we found that the CD1d1 reactive Ab-15F7 completely blocks NK interaction with CD1d1 beads and also completely reverses inhibition of NK lysis by CD1d1, the 15F7 Ab may bind at or near a site on CD1d1 relevant to NK cell receptor interaction. NKT cell recognition of CD1d1 is also blocked by the 15F7 Ab (18), suggesting that the T cell receptors of NKT cells and inhibitory receptor(s) of NK cells that recognize CD1d1, may bind at the same or adjacent site(s) on CD1d1. Our previous work demonstrated that mouse NK lysis could be inhibited by CD1d1 expression on target cells (25). In addition, we showed that an Ab specific for CD1d was able to partially revert the observed inhibition mediated by CD1d1, suggesting that a cell surface interaction, possibly with an NK inhibitory receptor, was occurring. Substantial new evidence for the existence of an inhibitory receptor that recognizes CD1d1 is provided by our present report. We demonstrate that CD1d1-bearing beads can bind and select a subset of NK cells that is strongly inhibited by CD1d1, relative to nonbinding NK cells. Our present observations that IL-2-activated NK cells, but not resting NK cells, bind specifically to CD1d1 beads is also consistent with our previous findings that indicated that activation of NK cells, by IL-2 or possibly by poly(I:C), for example, is necessary to detect the subset of CD1d1-regulated NK cells (25). Taken together, these results suggest that activation of NK cells is necessary for either the outgrowth/enhanced survival of a minor subset of NK cells that constitutively express such a receptor(s), or the de novo expression of a CD1d1-specific inhibitory receptor. The bead binding experiments in the present study did not suggest that even a minor subset of resting Rag-1−/− spleen cells, which are made up of 75–80% NK cells (data not shown), bind specifically to CD1d1. A significant portion, and possibly all of the nonspecific binding to beads observed with the fresh Rag-1−/− spleen cells, may be due to macrophages and dendritic cells which are known to interact with bead surfaces, but this was not investigated. Consistent with this possibility is that the nonspecific binding to beads diminishes with culture in IL-2 (Fig. 2⇑), and specific binding to CD1d1 beads increases. These are conditions where NK cells survive and expand, whereas myeloid-derived cells do not. Our results argue against the presence of a significant subset of fresh NK cells that constitutively expresses a CD1d1 specific receptor, but a definitive answer regarding such a possibility will require further study. If instead, expression of a putative CD1d1 inhibitory receptor is induced by NK cell activation via IL-2 or other means, then it is unlikely that typical Ly-49 molecules or CD94/NKG2A are candidate CD1d1 receptors. First, both of these receptor types appear to be constitutively expressed on NK cell subpopulations and their expression is apparently not further enhanced by culture in IL-2 (45, 46). Secondly, Ly-49 inhibitory receptors clearly function to recognize classical class I MHC allele products, while mouse CD94/NKG2A has a well-defined ligand: Qa-1b bound with class I MHC leader sequence-derived peptides. Recognition of CD1d1 by these receptors in addition to their known ligands would likely interfere with their presently defined roles in NK regulation (47, 48). Instead, it is possible that the putative CD1d1 inhibitory receptor may be among known IL-2 inducible NK receptors with presently undefined ligand specificities, or a novel IL-2 inducible receptor. Although IL-2 inducible (49), the Ig-domain and immunoreceptor tyrosine-based inhibitory motif containing inhibitory gp49 NK receptor has been shown to be an integrin receptor (50), and is therefore probably not a relevant inhibitory receptor specific for CD1d1. The NK gene complex (NKC), on chromosome 6 in mouse and chromosome 12 in humans, encodes receptors that regulate NK functions in mouse and man, respectively (51, 52). One NKC encoded C-type lectin-like receptor, killer lectin-like receptor G1 (KLRG-1), has increased expression on activated mouse NK cells. Killer lectin-like receptor G1 is unlikely to be a CD1d1 receptor because in cell adhesion assays, it does not mediate binding to cells that express class I MHC and are likely to also express CD1d1 (53). Furthermore, we have found that CD1d1 bead selection of IL-2-activated NK cells does not enrich for killer lectin-like receptor G1 expressing cells (data not shown). Additional NKC-encoded C-type lectin-like receptors might be candidates for the putative CD1d1 receptor expressed by NK cells. The NKC is large, spanning >4 Mb of DNA, and may encode additional candidate C-type lectin-like receptors (54). Another possibility is that a CD1d1-specific receptor may exist that is related to mouse Ig-domain and immunoreceptor tyrosine-based inhibitory motif-containing inhibitory receptors, such as paired Ig-like receptor B that is expressed on B cells and cells of the monocyte/macrophage lineage (55). In any case, further studies will be required to identify an inhibitory receptor specific for CD1d1. Using beads displaying naturally expressed CD1d1 as the selecting agent, we may now have a means to identify such a receptor by expression cloning strategies (56). In addition to identifying CD1d1-specific receptors expressed by NK cells, what role NK cell regulation by CD1d1 plays in innate immunity remains to be defined. It is interesting that regulation by CD1d1 only occurs with activated NK cells and thus may be important in later stages of innate responses. Inhibition of activated NK cells by CD1d1 may contribute to the dampening of a successful innate response to a pathogen and the return to homeostatic balance within the innate compartment of the immune system. It will also be of interest to determine what influences microbial infections have on CD1d1 regulation of NK cells. Microbial infection may result in expression of CD1d1 bound with microbe-derived glycolipids, instead of some endogenous glycolipids. Such a change may be discernable by CD1d1-specific inhibitory receptors, resulting in diminished NK inhibition and target lysis. An alternative possibility is that some microbe-derived glycolipids may actually enhance protection of infected cells, as a means of innate resistance evasion. It is worth noting that binding of bacterial lipid Ags was found to enhance inhibition of NK lysis by the human CD1b molecule (26). Our ability to identify and select CD1d1-regulated NK cells demonstrated in this study provides an opportunity to thoroughly address the role of CD1d1 in controlling NK cells in innate resistance to pathogens. We thank Dong-Er Gong, Dorothy Rutkowski, Juanita Wizniak, and Tara Tiffinger for excellent technical assistance. ↵1 This work was supported by operating grants from the Leukemia Research Fund of Canada and the Canadian Institutes of Health Research (to K.P.K. ), and by National Institutes of Health Grant AI45053 (to M.K.). K.P.K. is an Alberta Heritage Foundation for Medical Research scientist award recipient. P.B. was supported by an Alberta Heritage Foundation for Medical Research summer studentship. ↵3 Abbreviations used in this paper: α-GalCer, α-galactosylceramide; BCS, bovine calf serum; RAG, recombination activating gene; NKC, NK gene complex; IHL, intrahepatic lymphocyte; iCD1d1, insect cell expressed CD1d1; mCD1d1, mouse cell expressed CD1d1. Biron, C. A.. 1997. Activation and function of natural killer cell responses during viral infections. Curr. Opin. Immunol. 9:24. Trinchieri, G.. 1989. Biology of natural killer cells. Adv. Immunol. 47:187. Ljunggren, H. G., K. Karre. 1990. In search of the ’missing self’: MHC molecules and NK cell recognition. Immunol. Today 11:237. Burshtyn, D. N., A. M. Scharenberg, N. Wagtmann, S. Rajagopalan, K. Berrada, T. Yi, J. P. Kinet, E. O. Long. 1996. Recruitment of tyrosine phosphatase HCP by the killer cell inhibitor receptor. Immunity 4:77. Lanier, L. L.. 2001. On guard-activating NK cell receptors. Nat. Immunol. 2:23. Takei, F., J. Brennan, D. L. Mager. 1997. The Ly-49 family: genes, proteins and recognition of class I MHC. Immunol. Rev. 155:67. Long, E. O.. 1999. Regulation of immune responses through inhibitory receptors. Annu. Rev. Immunol. 17:875. Vance, R. E., J. R. Kraft, J. D. Altman, P. E. Jensen, D. H. Raulet. 1998. Mouse CD94/NKG2A is a natural killer cell receptor for the nonclassical major histocompatibility complex (MHC) class I molecule Qa-1b. J. Exp. Med. 188:1841. Brooks, A. G., F. Borrego, P. E. Posch, A. Patamawenu, C. J. Scorzelli, M. Ulbrecht, E. H. Weiss, J. E. Coligan. 1999. Specific recognition of HLA-E, but not classical, HLA class I molecules by soluble CD94/NKG2A and NK cells. J. Immunol. 162:305. Cerwenka, A., A. B. Bakker, T. McClanahan, J. Wagner, J. Wu, J. H. Phillips, L. L. Lanier. 2000. Retinoic acid early inducible genes define a ligand family for the activating NKG2D receptor in mice. Immunity 12:721. Diefenbach, A., A. M. Jamieson, S. D. Liu, N. Shastri, D. H. Raulet. 2000. Ligands for the murine NKG2D receptor: expression by tumor cells and activation of NK cells and macrophages. Nat. Immunol. 1:119. Brossay, L., M. Kronenberg. 1999. Highly conserved antigen-presenting function of CD1d molecules. Immunogenetics 50:146. Park, S. H., A. Bendelac. 2000. CD1-restricted T-cell responses and microbial infection. Nature 406:788. Brutkiewicz, R. R., J. R. Bennink, J. W. Yewdell, A. Bendelac. 1995. TAP-independent, β2-microglobulin-dependent surface expression of functional mouse CD1.1. J. Exp. Med. 182:1913. Teitell, M., H. R. Holcombe, L. Brossay, A. Hagenbaugh, M. J. Jackson, L. Pond, S. P. Balk, C. Terhorst, P. A. Peterson, M. Kronenberg. 1997. Nonclassical behavior of the mouse CD1 class I-like molecule. J. Immunol. 158:2143. Roark, J. H., S.-H. Park, J. Jayawardena, U. Kavita, M. Shannon, A. Bendelac. 1998. CD1.1 expression by mouse antigen-presenting cells and marginal zone B cells. J. Immunol. 160:3121. Joyce, S., A. S. Woods, J. W. Yewdell, J. R. Bennink, A. D. De Silva, A. Boesteanu, S. P. Balk, R. J. Cotter, R. R. Brutkiewicz. 1998. Natural ligand of mouse CD1d1: cellular glycosylphosphatidylinositol. Science 279:1541. Cui, J., T. Shin, T. Kawano, H. Sato, E. Kondo, I. Toura, Y. Kaneko, H. Koseki, M. Kanno, M. Taniguchi. 1997. Requirement for Vα14 NKT cells in IL-12-mediated rejection of tumors. Science 278:1623. Hammond, K. J., L. D. Poulton, L. J. Palmisano, P. A. Silveira, D. I. Godfrey, A. G. Baxter. 1998. α/β-T cell receptor (TCR)+CD4−CD8− (NKT) thymocytes prevent insulin-dependent diabetes mellitus in nonobese diabetic (NOD)/Lt mice by the influence of interleukin (IL)-4 and/or IL-10. J. Exp. Med. 187:1047. Chang, C. S., L. Brossay, M. Kronenberg, K. P. Kane. 1999. The murine nonclassical class I major histocompatibility complex-like CD1.1 molecule protects target cells from lymphokine-activated killer cell cytolysis. J. Exp. Med. 189:483. Carbone, E., G. Terrazano, A. Melian, D. Zanzi, L. Moretta, S. Porcelli, K. Karre, S. Zappacosta. 2000. Inhibition of human NK cell-mediated killing by CD1 molecules. J. Immunol. 164:6130. Brossay, L., D. Jullien, S. Cardell, B. Sydora, M. Burdin, R. L. Modlin, M. Kronenberg. 1997. Mouse CD1 in mainly expressed in hemopoietic-derived cells. J. Immunol. 159:1216. Austyn, J. M., S. Gordon. 1981. F4/80, a monoclonal antibody directed specifically against the mouse macrophage. Eur. J. Immunol. 11:805. Bhattacharya, A., M. E. Dorf, T. A. Springer. 1981. A shared alloantigenic determinant on Ia antigens encoded by the I-A and I-E subregions: evidence for I region gene duplication. J. Immunol. 127:2488. Leo, O., M. Foo, D. H. Sachs, L. E. Samelson, J. A. Bluestone. 1987. Identification of a monoclonal antibody specific for a murine T3 polypeptide. Proc. Natl. Acad. Sci. USA 84:1374. Kane, K. P., P. Champoux, M. F. Mescher. 1989. Solid-phase binding of class I and II MHC proteins: immunoassay and T cell recognition. Mol. Immunol. 26:759. Shen, L., T. A. Potter, K. P. Kane. 1996. Glu227→Lys substitution in the acidic loop of major histocompatibility complex class I α3 domain distinguishes low avidity CD8 coreceptor and avidity-enhanced CD8 accessory functions. J. Exp. Med. 184:1671. Bonnotte, B., N. Favre, M. Moutet, A. Fromentin, E. Solary, M. Martin, F. Martin. 2000. Role of tumor cell apoptosis in tumour antigen migration to the draining lymph nodes. J. Immunol. 164:1995. Silver, E. T.. 2001. Ly-49W, an activating receptor of nonobese diabetic mice with close homology to the inhibitory receptor Ly-49G, recognizes H-2Dk and H-2Dd. J. Immunol. 166:1. Curtsinger, J., M. J. Deeths, P. Pease, M. F. Mescher. 1997. Artificial cell surface constructs for studying receptor-ligand contributions to lymphocyte activation. J. Immunol. Methods 209:47. Mombaerts, P., J. Iacomini, R. S. Johnson, K. Herrup, S. Tonegawa, V. E. Papaioannou. 1992. RAG-1-deficient mice have no mature B and T lymphocytes. Cell 68:869. Kronenberg, M.. 2000. Lipid-CD1-reactive T cells. Trends Microbiol. 8:543. Kane, K. P., S. A. Goldstein, M. F. Mescher. 1988. Class I alloantigen is sufficient for cytolytic T lymphocyte binding and transmembrane signaling. Eur. J. Immunol. 18:1925. He, X. S., B. Rehermann, F. X. Lopez-Labrador, J. Boisvert, R. Cheung, J. Mumm, H. Wedemeyer, M. Berenguer, T. L. Wright, M. M. Davis, H. B. Greenberg. 1999. Quantitative analysis of hepatitis C virus-specific CD8+ T cells in peripheral blood and liver using peptide-MHC tetramers. Proc. Natl. Acad. Sci. USA 96:5692. Kwok, W. W., A. W. Liu, E. J. Novak, J. A. Gebe, R. A. Ettinger, G. T. Nepom, S. N. Reymond, D. M. Koelle. 2000. HLA-DQ tetramers identify epitope-specific T cells in peripheral blood of herpes simplex virus type 2-infected individuals: direct detection of immunodominant antigen-responsive cells. J. Immunol. 164:4244. Salcedo, M., F. Colucci, P. J. Dyson, L. A. Cotterill, F. A. Lemonnier, P. Kourilsky, J. P. Di Santo, H. G. Ljunggren, J. P. Abastado. 2000. Role of Qa-1b-binding receptors in the specificity of developing NK cells. Eur. J. Immunol. 30:1094. Hanke, T., H. Takizawa, C. W. McMahon, D. H. Busch, E. G. Pamer, J. D. Miller, J. D. Altman, Y. Liu, D. Cado, F. A. Lemonnier, P. J. Bjorkman, D. H. Raulet. 1999. Direct assessment of MHC class I binding by seven Ly49 inhibitory NK cell receptors. Immunity 11:67. Dorfman, J. R., D. H. Raulet. 1998. Acquisition of Ly49 receptor expression by developing natural killer cells. J. Exp. Med. 187:609. Sivakumar, P. V., A. Gunturi, M. Salcedo, J. D. Schatzle, W. C. Lai, Z. Kurepa, L. Pitcher, M. S. Seaman, F. A. Lemonnier, M. Bennett, et al 1999. Expression of functional CD94/NKG2A inhibitory receptors on fetal NK1.1+ Ly-49− cells: a possible mechanism of tolerance during NK cell development. J. Immunol. 162:6976. Ravetch, J. V., L. L. Lanier. 2000. Immune inhibitory receptors. Science 290:84. Kraft, J. R., R. E. Vance, J. Pohl, A. M. Martin, D. H. Raulet, P. E. Jensen. 2000. Analysis of Qa-1b peptide binding specificity and the capacity of CD94/NKG2A to discriminate between Qa-1-peptide complexes. J. Exp. Med. 192:613. Wang, L. L., D. T. Chu, A. O. Dokun, W. M. Yokoyama. 2000. Inducible expression of the gp49B inhibitory receptor on NK cells. J. Immunol. 164:5215. Castells, M. C., L. B. Klickstein, K. Hassani, J. A. Cumplido, M. E. Lacouture, K. F. Austen, H. R. Katz. 2001. gp49B1-αvβ3 interaction inhibits antigen-induced mast cell activation. Nat. Immunol. 2:436. Yokoyama, W. M., W. E. Seaman. 1993. The Ly-49 and NKR-P1 gene families encoding lectin-like receptors on natural killer cells: the NK gene complex. Annu. Rev. Immunol. 11:613. Trowsdale, J.. 2001. Genetic and functional relationships between MHC and NK receptor genes. Immunity 15:363. Corral, L., T. Hanke, R. E. Vance, D. Cado, D. H. Raulet. 2000. NK cell expression of the killer cell lectin-like receptor G1 (KLRG1), the mouse homolog of MAFA, is modulated by MHC class I molecules. Eur. J. Immunol. 30:920. Brown, M. G., J. Zhang, Y. Du, J. Stoll, W. M. Yokoyama, A. A. Scalzo. 1999. Localization on a physical map of the NKC-linked CMV1 locus between Ly-49b and the Prp gene cluster on mouse chromosome 6. J. Immunol. 163:1991. Kubagawa, H., C. C. Chen, L. H. Ho, T. S. Shimada, L. Gartland, C. Mashburn, T. Uehara, J. V. Ravetch, M. D. Cooper. 1999. Biochemical nature and cellular distribution of the paired immunoglobulin-like receptors, PIR-A and PIR-B. J. Exp. Med. 189:309. Seed, B.. 1995. Developments in expression cloning. Curr. Opin. Biotechnol. 6:567.